2385 Sparrows: For All the Sparrows at Sea is a project which pays remembrance to all the men of the Royal Naval Patrol Service (RNPS) who were lost at sea during WW2. Never returning home, they have no grave but the sea. 2385 sparrows will be made, one to represent each man lost at sea. The sparrow being chosen for the nickname given to the men of the RNPS, nicknamed after the ‘Sparrow’s Nest’, the name given to the headquarters of the RNPS – HMS Europa in Lowestoft. Thus all those who passed through HMS Europa were sparrows from the nest, and these 2385 men unfortunately never made it back there. It’s a 25 year project, which sounds like a really long time, but with also continuing to create paintings, drawings, and prints, and with each sparrow being hand built and hand painted, this gives me the time to create them. In 25 years, in 2043, it will also be the 100 year anniversary of my Grandfather’s passing, and it is my Grandfather who is the initial inspiration behind this project having too lost his life during WW2 and is forever lost at sea. It is my intention to fully launch the finished sparrows in sets of 25, which very loosely represents the crew of a trawler, one of the small boats used by the RNPS. 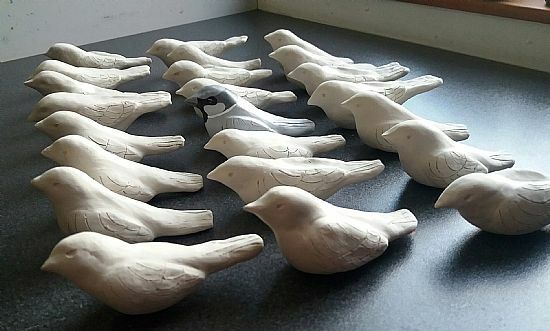 The first batch of 25 birds have been made but they still have to be glazed. They will be painted in a very distinct way, with each sparrow being truly unique. I've been busy trying to make as many birds as possible due to a forthcoming situation where I may no longer have access to a kiln. So this project has been made top priority at the moment, but then if I have to switch to air drying clay then needs must. I've learnt through my studio practice and jobs I've undertaken that adaptability is always a good thing to have. I have also made a start painting one of the birds already fired, and I am now super excited to see them fully finished!